Well hello! It’s been a minute or two since my last post! Thankfully that doesn’t mean I’ve been idle – just trying to juggle all the balls I have up in the air at any given time. Being a creative person can be challenging, especially when ideas come rapid fire. Last time I wrote to you about my new found passion for enameling. That has not dimmed by any means and I am currently working on some fun ideas. 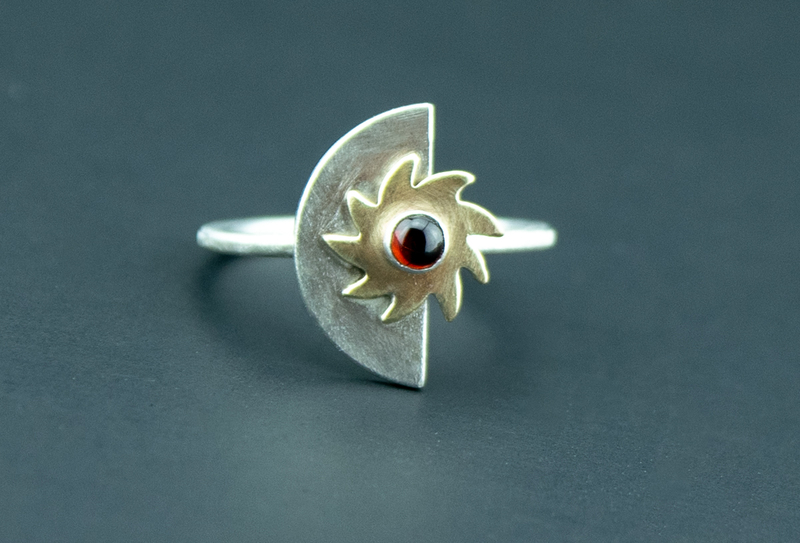 But right now I have to tell you, I am completely obsessed with tiny stones, and especially setting them in rings. Aside from bracelets, rings are the only jewelry pieces you can actually admire while you wear them – unless you want to park yourself in front of a mirror;) Rings can also be deeply personal. I can’t tell you how touched I am when a customer tells me often deeply sentimental reasons for purchasing a specific ring or stacking set. The idea of creating pieces that have added personality in the form of gemstones has been with me for some time. I just didn’t want to put it out there for the world to see until I was completely sure, I could offer something I was completely in love with. One of my resolutions for this year was to really give this my full attention. So, in the next few months you can expect to see quite a few more new pieces featuring tiny and petite gemstones. And I plan on adding an array of different colors as well as rosecut versions, too. In the meantime you are welcome to take a look at some of the pieces I recently added to the collection. And please do let me know what you think! I love your input and often use it as inspiration when I create. First up: Some of my latest gemstone additions in aventurine, citrine and garnet. Don’t you love the mix of opaque and translucent stones as well as different sizes and textures? The top two are sold as part of a set, while the bottom is sold as a single. Each can be created as a single or you could add the bottom ring to a stack. When I first laid eyes on these little sunbursts, I knew they had great potential for fun pieces, so here are a couple of different options. The little sunbursts are also fun with more rustic hammered patina copper. And don’t you just love the gorgeous green on these lovely glass cabochons? Next up are some of the new stacking ring sets I talked about above. This set is created in a slightly thicker wire gauge. There are more versions listed in my Etsy shop for you to admire right now! I am currently waiting for a shipment of peridots, amethysts and rhodolite garnets. Can’t wait to get my hot little hands on those, because I already have a couple of other designs awaiting completion. The plan is to have birthstone gems on hand for every month and to offer more personalized options in the near future. Are you on board? Oh yes, and before I forget, all of the rings shown can be created in your desired size. The necklace is offered in different lengths as well.